Why is My Cat or Dog Losing Hair? There are several reasons why cats and dogs can lose their hair. The first thing to look at concerns if they are itchy or not. Losing hair because the skin is inflamed has different causes than non-itchy hair loss. Licking, biting, scratching, or rubbing the skin are all considered itching. 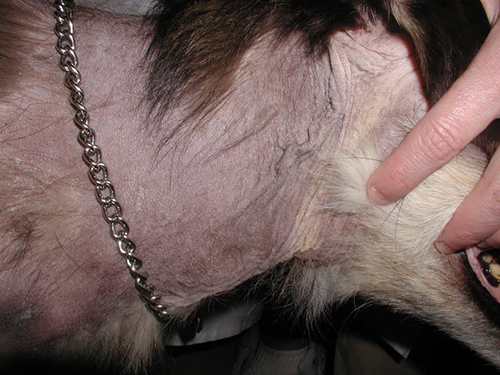 --The pet is barbering the hair- which means they are chewing and pulling out their hair as a --way to itch the skin. --Allergies to food, fleas, or environmental allergens like dust mites or pollens. At your appointment, A Central North Animal Hospital Inc. will take samples from the surface of the skin and determine if infections or parasites are playing a role. Infections of the skin are often secondary to an underlying process like allergies, especially when the pet is itchy. We will work with you to diagnose the underlying cause and discuss treatments to prevent the problem from returning. Cytology is the microscopic examination of cells that have been collected from body tissues. By examining the appearance of these cells and looking for inflammation or infection, it is often possible to diagnose specific diseases or determine the nature of a pet's illness. When is cytology by Fine Needle Aspiration performed? What happens to the collected cells? When solid tissue is sampled, a small amount of material accumulates in the hub of the needle. This material is immediately and gently expelled onto a clean glass slide, spread in a thin layer, and rapidly dried by waving the slide in the air or by placing it in front of a fan or portable hair dryer. This is called making an "air-dried smear"
When a fluid sample is collected, air-dried smears are often prepared directly from the material in the syringe, and the remaining fluid is placed in transport tubes or containers. The smears and the containers are then sent to the laboratory for further analysis. This typically includes measurement of the cellularity and protein content of the fluid, as well as preparation of additional slides. If the sample is very thin and watery, sometimes the sample is concentrated before the slides are made, which provides more cells to look at. The slides are then stained with special dyes, and examined. This dog has a severe yeast infection and allergies. --What types of tumors can be removed? Almost any tumor can be removed under general anesthesia. General anesthesia is very appropriate for large, spreading, or deep masses. Anesthesia may be needed for pets of certain personalities, or for masses on the ears or near the eyes. We specialize in removing small superficial tumors without the need for general anesthesia using a local nerve block. The most common masses we remove are sebaceous adenomas. 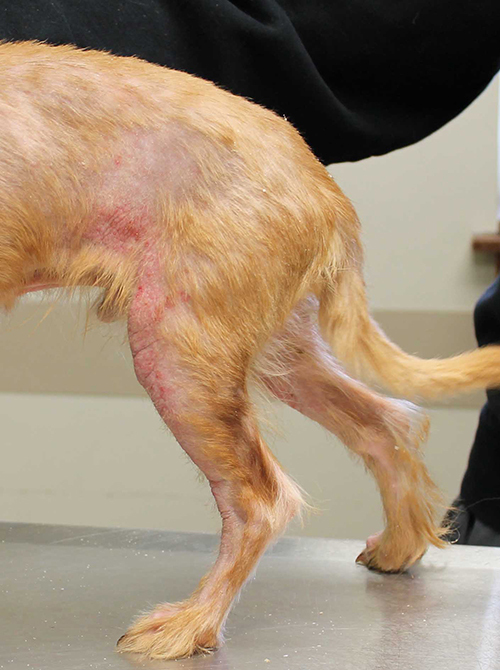 These are non-cancerous and often small (less than 2cm), but these can be itchy and bother many pets. These are unsightly on pets because they bleed easily, become infected easily, and may exude a waxy substance. Many pets have large numbers of these warty masses, we can take off several at a time. This is Sebaceous Adenoma in a dog. We do not use lasers to cut skin or remove masses because this type of laser (CO2) uses heat to destroy tissue which causes wider damage and more pain than a blade. Laser use has an increased risk for igniting the hair, can damage the eyes, and produces harmful smoke. Surgeons for humans rarely use CO2 lasers because of these same issues. In veterinary medicine, dermatologists have the role of managing ear diseases. This is because many skin diseases in pets manifest with ear issues. Dr. Gill & his staff has extensive training in procedures to remove ear canal masses, manage infections in the middle ear, and correct chronic inflammation and infection of the ear canals. Most of the anesthetized procedures we perform in our clinic involve the ears. We have elongated grasping tools, specialized scopes, and precise techniques to insert tools into and take samples from the middle ear for cultures and cleaning. This often involves a myringotomy, a technique to make a hole in the eardrum to pass instruments through, usually to flush infection or pus that has built up behind the ear drum. Why does my dog or cat keep getting ear infections? The short answer to this question is that the underlying problem is not controlled. If an underlying problem cannot be found, then long term therapy is likely needed or the infection will come back. There are 3 main types of underlying problems that cause ear infections to keep coming back (or not go away) when they are treated: allergies, an object in the canal (mites, tumors, foreign material),a middle ear infection and Atopy in dogs. Ear infections can be very painful for the dog or cat and should be treated right away. Routine care of the ears and management of the underlying problem will help prevent the problem from coming back. Veterinary dermatologists specialize in the treatment of ear diseases and the underlying causes of most infections and can perform specialized procedures to help treat these problems. When some dogs (especially cocker spaniels) have infections in the ear for a long time, the ear canal swells closed. If the canal cannot be opened with aggressive treatment, the infections can be very difficult to manage. Ear infections are painful. If left untreated, severe or long term ear infections can cause a head tilt, paralysis of that side of the face, calcium deposits in the ear canal, and dry eye. The ear canal is commonly affected when dogs and cats have allergies. Allergies cause the skin to be inflamed, which allows overgrowth of otherwise normal yeast and/or bacteria. This overgrowth causes itchiness and pain, and scratching and rubbing contribute to making the infection and inflammation worse. Because it is inflamed, the ear canal secretes large amounts of wax. The ears may develop an odor from the infection. Seasonal Atopic Otitis Eplema can occur when it is non-seasonal and typically the allergies can get worse. Otitis Media (middle ear infection) occurs when a cold, allergy or respiratory infection. The presence of bacteria of bacteria or viruses lead to the accumulation of pus and mucus. The condition can last a few weeks or months in not properly treated. Pseudomonas aeruginosa is a type of bacteria that is found all over in the environment. Normal animals do not develop infections when this organism gets on the skin or in the ears. When a pet has damage to the ears because of chronic recurrent ear infections, pseudomonas happily starts growing. Then the ear infection takes on a new appearance. The canals become very sore with pus exuding or moisture can be heard deep within the ear. A strong smell may develop, and the pet may be lethargic with pain. The ear drum often ruptures and the bacteria contaminate the middle ear. Strong oral and topical ear medications must be used aggressively to control this infection. With long term infections of the ear (from any cause), the bacteria can move past the ear drum and get into the middle ear. These infections are more difficult to treat and require long term medications. Often, pseudomonas bacteria are involved. 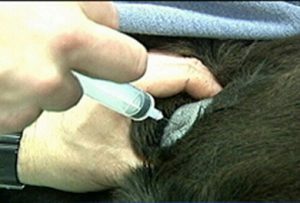 Sometimes ear infections need to be treated with a special procedure to clean out and infuse treatments directly into the middle ear while the pet is under anesthesia.